The Wizard of Odds: It's Snack Time at the Alamo Bowl! It's Snack Time at the Alamo Bowl! 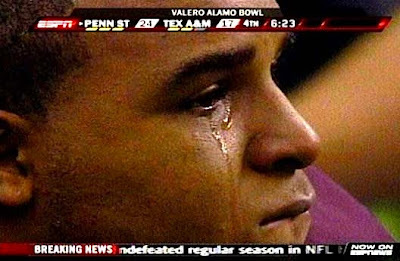 Quite a week in San Antonio for Texas A&M. First came the "Joe Paterno's on his death bed! And someone needs to find him a casket!" embarrassment brought upon the school by a Yell Leader. 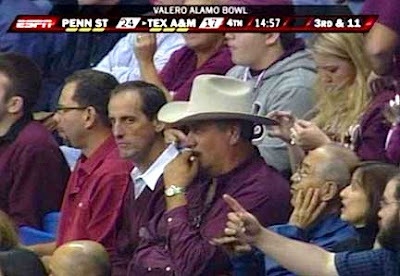 Then came this Alamo Bowl classic. 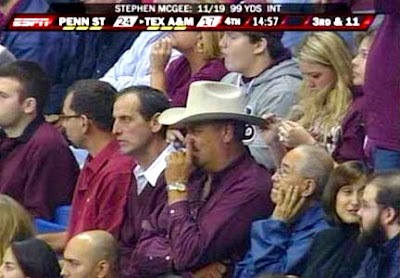 We understand the lines were lengthy at the Alamodome concession stands, but that's no excuse for digging into an orifice for a snack. One has to wonder what else was on the menu for the evening. And the guy in the lower right, is he offering for a free snack? 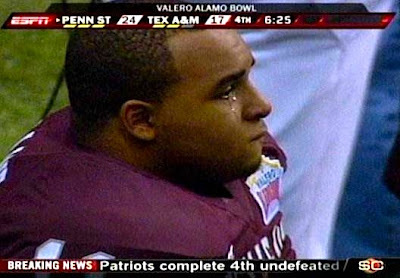 Texas A&M lost to Penn State, 24-17, leaving Aggie cheeseburger tailback Jorvorskie Lane in tears. Yes, "Remember the Alamo" has a new meaning. Thanks to TV Tan Line for the images.